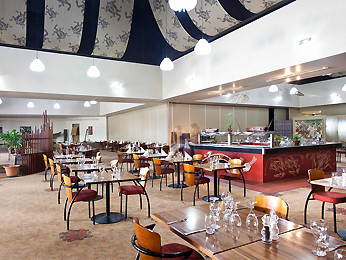 Escarpment Restaurant offers modern Australian cuisine in a relaxed, open plan seating environment. Escarpment is open seven days a week for breakfast, lunch and dinner. Executive Chef Duane has created a unique menu showcasing local Indigenous flavours, local produce and bush tucker cuisine. Tout était excellent, mais la résonance de la salle est un peu gênant. Fantastic food off the menu for the third time! Great to see a well-chosen small range on the menu, and the focus on local foods. The Arnhem beef was delicious medium rare, and the lemon sauce on the barramundi was effective. The food was presented attractively and had generous portion sizes. We’ll be back! We had a fantastic time for our three night stay and ate here every night. Being coeliac, my only request would be offering some sort of potato that I could have eaten. The steak salad and chips option left me with just steak and broccoli. On the whole we loved it here though and I’m grateful there was food for me. Unfortunately my fish was inedible, tough and stringy. The rest of the meal was lovely. I found the noise of the children's area very disturbing. I like children but wonder if the folding door could be used. Very nice service and food over three days. Very happy ! Great buffet and variety of options. The service was excellent with prompt and freindly service. 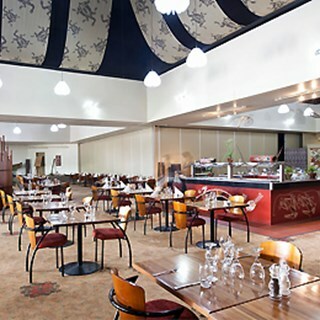 We had the buffet and it was excellent compared to what you get in Darwin we thought this was better food and an excellent range. The service was also better then some of the experiences in Darwin. Would definitely recommend this restaurant to all our friends in Darwin. The only draw back was the drinks are are expensive I gave never had to pay $9.00 for a bear or $8.50 for a glass of wine this us a bit steep and I got the feeling that it was overpriced due to being in Jabiru.